IMAGE: Gae Aulenti, Elements, 1972. The current curators, then, bring forward the contestatory environments as worthy of another show. 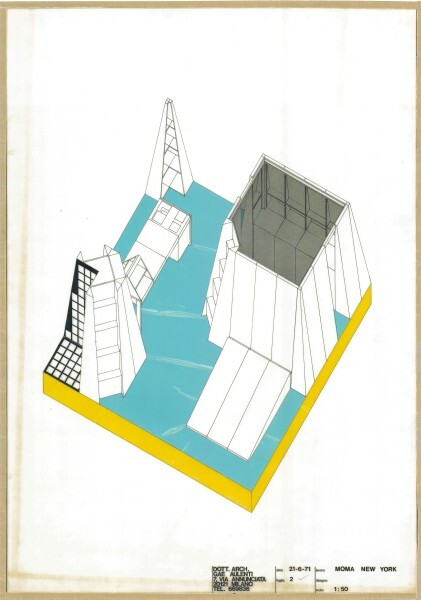 Far from recreating these environments in the gallery, they excavate archival documents, drawings, collages, models, photographs of the original exhibit, and movies that accompanied each environment at the MoMA viewing. Equally significant are the associated public events with the curators, Ambasz, and the rare opportunity with 9999’s Carlo Caldini who in his lecture brought in original materials that could as well have been sealed off in the exhibition stands, and passed them around giving all in the audience the delight of being the curious researcher in the archive.